januari 2012 | 140 blz. 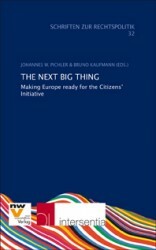 The Introduction of the European Citizen’s Initiative, the first transnational participative instrument ever, is a milestone in the history of democracy. From now on, citizens have the same rights as nation-states and national parliaments to be the political agenda-setters on the supranational level. januari 2011 | 110 blz. In late 2009, Europe was given a new “constitution” with the Lisbon Treaty. Now, two years later, one of the key innovations of this new treaty, the European Citizens’ Initiative, is about to become fully operational. 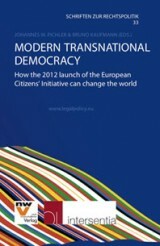 For the very first time in world history, citizens across national borders will be able to determine the common political agenda by way of a transnational direct democratic procedure.